Every year, I like to get a head-start on the New Year by looking forward and penciling in the majority of the major events that I can expect. This includes national holidays, paydays, birthdays, US holidays (since I live in Korea), family vacations, and my own vision planning days. Last year, I also learned the great value of regular blogging to grow a blog’s regular audience. By posting something new everyday, I took my wife’s Korean teaching website and grew the audience from 300 per month to over 8,000 per month in the span of just 6 months (April – September). With the birth of our daughter, I’ve tapered off the new posting for the past few months, but come January, I’m looking forward to getting back on a regular schedule of blog posts – as well as grow a few other projects I’m working on with at least weekly posts there. 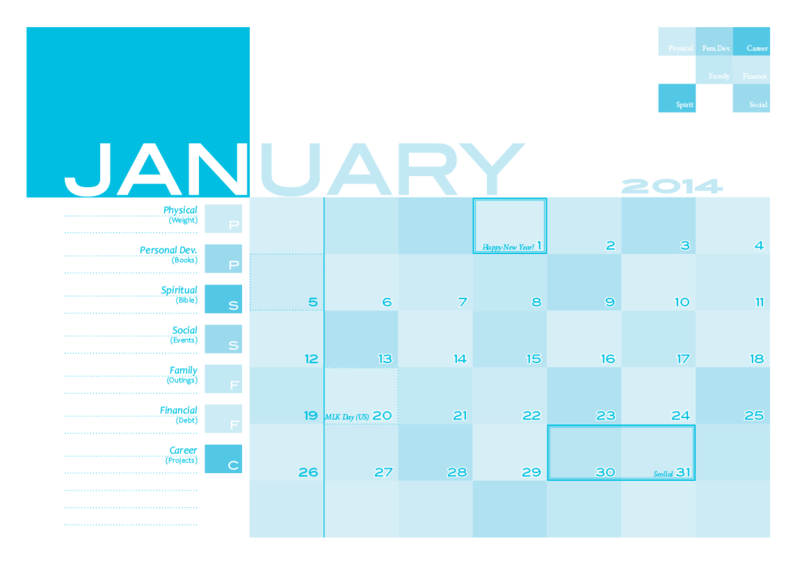 So, in order to (1) better facilitate my blog planning; (2) maintain a visible record of blog growth; and (3) give myself a little bit of accountability with my blogging, I’ve designed this Special 2014 Blogging Calendar. You can download it as a PDF if you’d like. Recently I was reading Dan Miller’s 48 Days to the Work You Love and found something interesting in chapter 4 called a “Wheel of Life.” In it, Miller lays out a new paradigm for a successful life. Most people focus on only ONE area of this wheel, but he says that success in ALL areas is necessary in order to live a fulfilling life. It’s truly unfortunate when you see massive success in ONE area of life at the expense of all the others, or even just at the expense of ONE of the others. There was a time in my life where I focused so much on Personal Development (getting my Master’s degree) that my Family suffered greatly as a result. 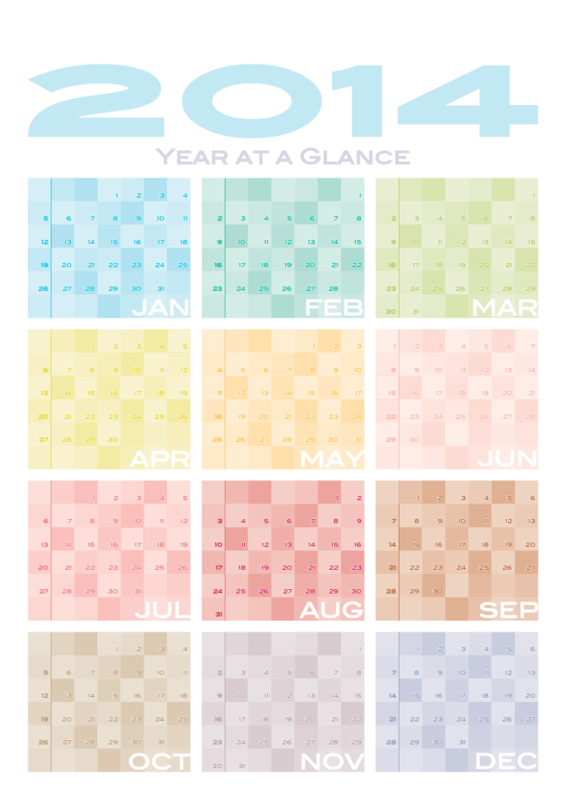 This calendar is designed with the “Wheel of Life” in mind. Each page contains a section for the 7 areas of life development. 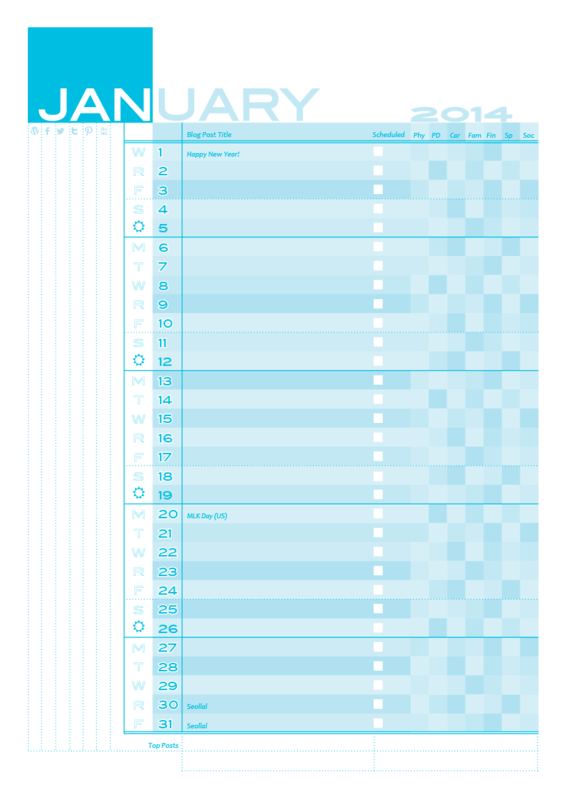 On the “Month View” pages, there is a left sidebar with space for written and trackable GOALS in each area. On the “Blog List View” pages, there is a checkbox section to the right of the list. This is a good way to keep track of either (1) the days that you work on that particular area of your life, or (2) the blog posts you write that focus on one (or more) of those life areas. A sidebar to the left where you can check off the social media you used to promote your blog that day. A checkbox after the Post Title for “Scheduled” posts. A box at the bottom to keep track of your “Top Posts” for the month. With Korean national holidays (red days) boxed in (since I live in Korea). With U.S. holidays “penciled in” (since I’m American). On A4-size paper (Korean paper), but should still look good if you “Print to Fit” on US Letter size paper. I may later update the design to be “strictly US” (on US Letter paper, without Korean holidays), but for now, this suits my needs.